Yeah, but: Perhaps I need more trust. The Long Version: The crossrack is the only pannier I've seen with this design: it only attaches to the seat post, but holds a regular pannier instead of a rack-top bag. 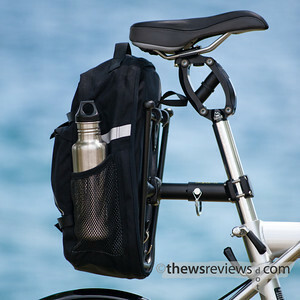 This is a fantastic idea, since panniers are easy to find in a variety of styles and styles. Rack-top bags are much more limited, and typically only range from small to not-very-large. The crossrack also puts the load vertically, closer to the centre of gravity for the bike, while the rack-top styles are long unsupported beam that stick out into space. I wonder why the crossrack didn't happen sooner. I've put a pannier from Mountain Equipment Co-op on mine; it attaches with a zip-off panel that hides backpack straps. 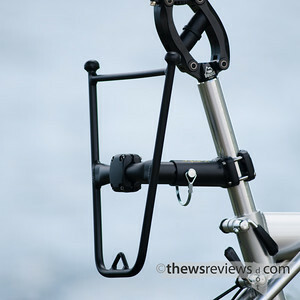 The crossrack is adjustable, and I've angled mine so that it's canted slightly forward, thinking that it would put less stress on the attachment points on the pannier. 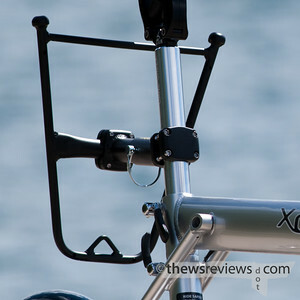 Xootr's page shows it tipped the other way, which will let the rack and bag be mounted on bikes with less space between the rear wheel and seat. The Xootr Swift, as a 20" wheeled bike, is quite generous in this respect. I'd be hesitant to put it on a bike with big wheels and a small frame, but for larger vehicles, it should be great. The crossrack is rated for 25 pounds. It's a two-piece design that's joined with a pin, so I do hesitate a teeny tiny bit when I add too much weight. The counter benefit is that it makes it easy to pull the rack off of the bike when it's squeezed into a narrow space for storage. Unfortunately, leaving the clamp on the seatpost means that it can't drop down and lock the Swift in its folded position. That huge dilemma was solved with one of my many reflector-and-velcro ankle bands, several of which I carry in my pannier for no particular reason. Other than that, I have no complaints. The bag carries everything I need, and it being on the centreline of the bike means that it's protected if I fall over. Having no rack below it means that my camera-du-jour isn't bouncing off of a solid platform all of the time. Even if I had a standard bike that could take a standard rack, I'd still choose the crossrack for small loads and day-to-day use. Simply beautiful! Thanks. My Cannondale needs something such as this.